What are the differences between cold symptoms and flu symptoms? Cold and flu symptoms can sometimes overlap. If you’re trying to determine if your symptoms are a cold or the flu, check out our info on cold and flu symptoms and how to tell the difference between a cold and flu. TIP! The common cold does not generally produce fever in adults, however fever can often be found in children with colds and can climb to 102ºF in infants and young children. How does a cold feel different from the flu? Cold and flu symptoms can sometimes feel similar. The key is in understanding how a cold feels different from a flu. 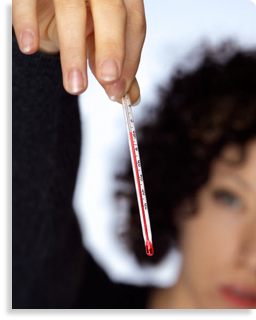 A fever (generally between 100 and 102) usually accompanies the flu and lasts 3 to 4 days. It is rare to develop a fever from a cold, though more common in children. Severe headaches and body-aches often accompany the flu, while these symptoms are slight or non-existent with colds. Additionally, the flu usually causes exhaustion, which is not a general symptom of the common cold, despite feeling a bit run-down. A stuffy nose, sore throat and sneezing more often indicate a cold than they do the flu. In most cases, cold and flu symptoms can be relieved by taking an OTC cold and flu medication, like Contac® Cold + Flu, and drinking plenty of water. National Institute of Allergy and Infectious Diseases. Flu (Influenza): Key Facts about Influenza (Flu) & Flu Vaccine. Retrieved from: http://www.niaid.nih.gov/topics/Flu/understandingFlu/Pages/keyFacts.aspx. January 28, 2012. U.S. Department of Health and Human Services; National Institutes of Health. Is it a Cold or the Flu? 2008. www.niaid.nih.gov. January 28, 2012.